Presidential candidate of Ukraine Volodymyr Zelensky calls on President Petro Poroshenko to carry out his duties and promises, rather than running after them on TV channels, giving medical samples and performing at the stadium. "I want to appeal to a man who occupies a very serious post - the post of president of Ukraine. Mr. Poroshenko, I really want you to move beyond slogans to meaningful action. 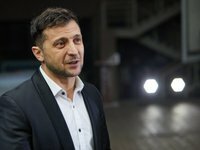 Namely, imprison the murderers of Kateryna Handziuk, the Svynarchuks and remember that you have forgotten about our captured sailors, who are behind bars now and waiting for you while you rush through the [TV] channels looking Zelensky, giving medical samples and shouting at the stadium," Zelensky said in a video message that he posted on his Facebook page on Monday. "Please do it. This is your concern, since a showman can become president, and the president who became a showman is a shame. Debates are on April 19, duties are every day," Zelensky said.